Tour dates: 6 June - 11 June 2007. The Easyjet flight to Glasgow went without problems. We got our car at the airport. We didn't go to Glasgow because traffic is really bad in the afternoon, so we had chosen Stirling as our destination for the first day. It's quite close to Glasgow. 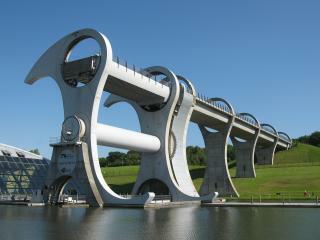 On the way there, we made a detour to the Falkirk Wheel, a large lock that lifts boats. It's built like a huge ferris wheel with two pods that carry boats up to a concrete bridge that connects to a river up on a hill. It's hugely elaborate and completely pointless - it's all just a tourist attraction. Stirling is a beautiful town that is a perfect setting for our first day in Scotland. It climbs up a hill with a castle and cemetary on top. The houses are built in that dark gloomy gothic style - not the soaring airy style of gothic cathedrals, but more squat and fewer windows. Scotland's weather is said to be always cold and rainy. Our weather was warm and sunny. The next morning we went back to Stirling Castle and explored the castle and its exhibitions. They are still renovating it, and in the main castle they have excellent displays that do not merely recount historical facts, but point out details and unsolved riddles in the design of the rooms. Very well done. Other parts of the castle have been so meticulously renovated to appear a little synthetic though. 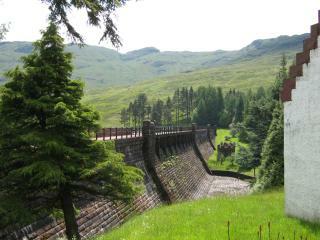 The Trossachs are a national park with numerous Lochs (lakes) framed with green mountains. From Stirling we first went to Aberfoyle, a small town with restaurants at the edge of the Trossachs. From there we followed a narrow road that wound its way through the mountains towards Loch Lomond, passing Loch Ard, Loch Chon, and Loch Arklet. The road is exceedingly scenic, with beautiful views of the Lochs, forests, and valleys with the green mountains of the Trossachs in the background. There is almost no traffic, and many turnouts because the road is too narrow in most parts for two cars to pass. There is a small village, Inversnaid, at the end of the road; a ferry crosses Loch Lomond to the other side but it doesn't take cars. Nice hiking paths along the edge of the Loch begin here. 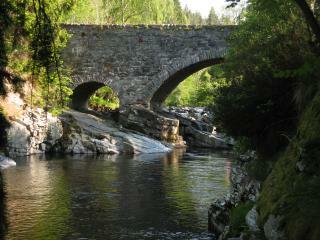 After spending some time there, we went back to Aberfoyle. From there, we followed the slow but scenic road over Duke's pass, past Loch Venachar, until we met with the A84 road that circles the northern Trossachs. 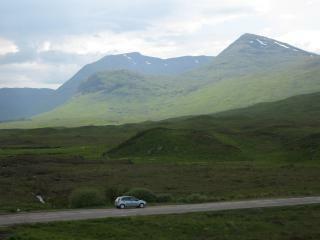 Eventually we left the Trossachs and entered the Scottish Highlands. The scenery here is amazing - huge valleys surrounded by distant mountains, and many small lakes. Everything is very green, but there are few trees. It was getting late, so our destination for the day was Fort William. This is a small town that is working hard at being as unattractive as possible. It's at the edge of a Loch, but it's barricaded with the main motorway and the few crossings serve only to access the parking lots. 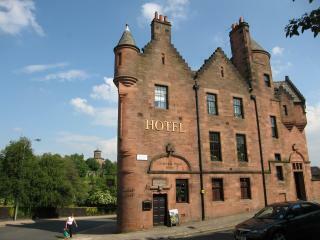 We had chosen a beautiful old St. Andrews Guesthouse to stay, but it was full. So were several other hotels. Eventually we found a room at a small B&B. What takes so many people to this cheerless place? We had dinner at the Restaurant No. 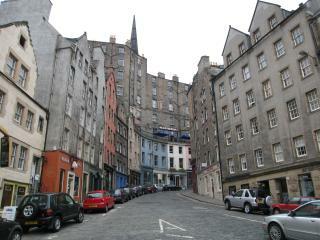 4 off the main pedestrian zone. 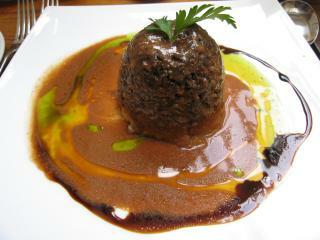 Very good food there; and I had an excellent Haggis. That's a Scottish delicacy that, according to the friendly waiter, consists of "kidneys and other things". He wouldnt't go into details. Check it out at Wikipedia. Once again, the weather was atypically warm and sunny, with a few passing clouds. In the morning we took the road to Mallaig, a small town across from the Isle of Skye. 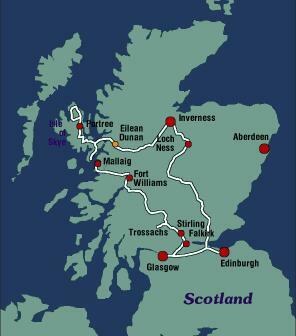 Once again, this is a scenic route that runs along rivers and Lochs, between steep green hills with virtually no villages or houses. 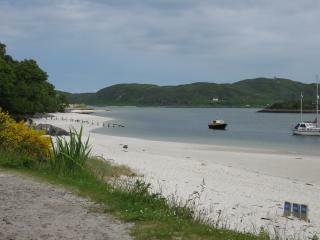 Shortly before Arisaig, the Coastal Alternative Route turns off to the left and closely follows the coastline. Mallaig is a small town where the ferries to the Isle of Skye leave. There isn't much to see here; the harbor is larger than the little downtown. There are a few restaurants here and rows of little houses up the hill. The ferry ride is short, and brought us to the unremarkable town of Ardvasar. 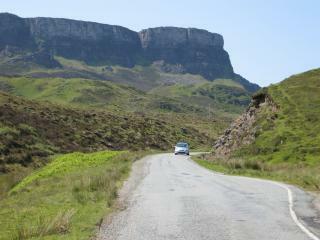 From here we followed the road to Portree, probably the main town on the Isle of Skye. 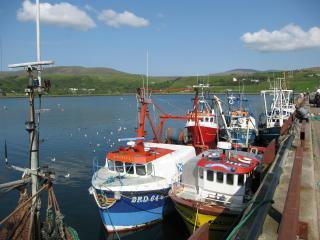 Portree is small but quite nice, especially the harbor area. We had called the day before and couldn't find an available room, but when we arrived it turned out that there are lots of hotels with vacancies, but only the ones listed in the Lonely Planet guidebook are full. We had lunch here, briefly watched a traditioinal wedding with men in kilts, and then continued to Flodigarry, where we had reserved a room in the hostel. The road there is very narrow and very scenic; with green hills rising on both sides, and frequent views of lochs and the sea. Once again we had perfect warm and sunny weather. At first we passed the hostel to see an old ruined piper school at an extremely scenic spot atop the cliffs near Kilmaluag, and then followed the road around the island to Uig, which turned out to be a small down-to-business ferry harbor with a few houses overlooking a small bay. But the road, as always here, is beautiful. 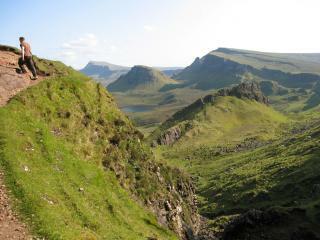 On the way back to the hostel, we stopped at the Quiraing trail. The trail head is right at the hilltop overlooking Flodigarry on the direct road from Uig. We followed the trail along the edge of the hills for some three kilometers, to a point where we could see the sea. The trail is fairly easy even with sturdy sneakers, and has stunning views of the surrounding mountains and seashore. Once again we had one of those unlikely beautiful sunny and warm days. Even the postcards they sell around here don't show perfect blue skies like we were having. The destination for the day was Inverness, but first we had to follow the coastal route to the bridge to Kyle on mainland Scotland. Once again we enjoyed the scenic narrow highway under perfect blue skies, with many views of the sea and the mountains. Early in the morning there is virtually no traffic. Shortly after Kyle, there is a beautiful castle, Eilean Dunan Castle, built on a very small island in the river and connected to the shore with a bridge. It's nicely restored and contains original decorations, complete with a diorama of a working kitchen, dining hall, living spaces, and other rooms. The views are uniquely Scottish. 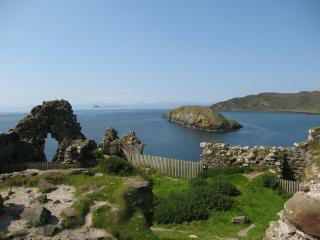 The banner picture at the top of this page is Eilean Dunan too. 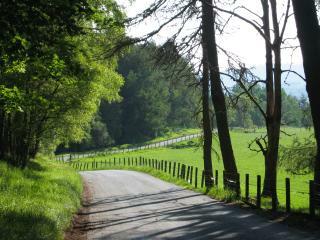 The second half of the road to Inverness runs alongside Loch Ness. Tourism was refreshingly mild. We stopped at a tourist center, snapped a few obligatory pictures, declared a couple of waves to be incontrovertible proof of Nessie's existence, and drove on to Inverness. (Nessie is a mythical monster living in the lake, and is regularly "seen" by tourists.) Loch Ness is a very long and narrow lake with no outstanding features, so perhaps the natives can be forgiven for riding that silly Nessie story. 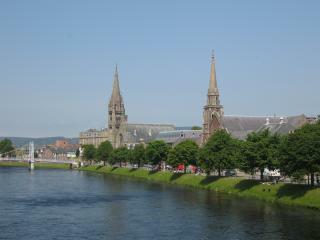 Inverness is a large town on the River Ness. It's nice enough, with many old buildings and a boring castle overlooking downtown, but there is a little too much traffic and too many modern buildings. Stirling was far more interesting. We had arranged a room at the Aviemore Resort, but when we got there, we were immediately siezed by a strong urge to leave. We had hoped for a village in the Grampian Mountains, but it's a drab and faceless tourist town built in the sixties, and our hotel was a huge concrete affair surrounded by large parking lots. So we fled and took a small road east, hoping to find a B&B in Insh. A few miles before Insh we saw a guest house sign and followed it for half a mile to the March House in Feshiebridge. What a difference - a small home with nice cozy rooms and living room, winter garden, a friendly hostess who offered us tea, in a quiet spot in the forest with a river running nearby. It cost less than a third of the Aviemore hotel bunker. 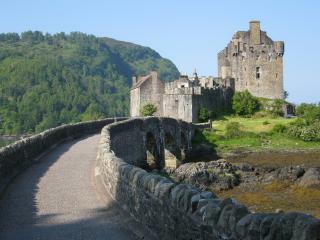 That's what I am looking for when traveling to Scotland. Recommended. I spent the remainder of the day hiking along the river, and to the nearby Loch Insh, and we watched the sunset from the Cairngorm mountainsm. The next morning was overcast, and we even got a little rain on the way to Edinburgh. We checked into the hotel we had reserved the night before, and started exploring. The Lonely planet describes Edinburgh as one of the most beautiful cities in Europe but that seems a little over the top. I spent a long weekend in Prague a few weeks earlier and Edinburgh doesn't play in the same league. Downtown is nice with its old buildings, especially the Royal Street that connects the castle and the Palace of Holyrood House, but it's all built from that dark sandstone that makes it all look a little gloomy. A bit away from the Royal Street there are many modern buildings, apparently carefully aged to preserve the gloominess. And they have a knack for dumping the ugliest conceivable modern monstrosities in the middle of their old town - close to the castle they are currently constructing an atrocious shopping mall, and someone must have worked real hard to cut downtown in half with a train station like a wound in the middle of this city. A pity. In the evening we visited the suburb of Leigh, presented as an up-and-coming hip place with lots of cafes and pubs, but it's more like an abandoned industrial area with a few restaurants and lots of new condos. I very much doubt that this will ever amount to very much because there is no old infrastructure, and putting up new condos just makes it synthetic and faceless. 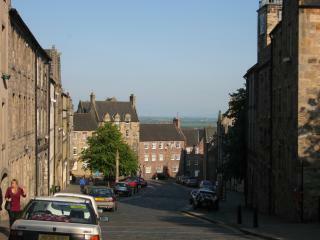 If you want to see an old town with lots of atmosphere, see Stirling or Glasgow. 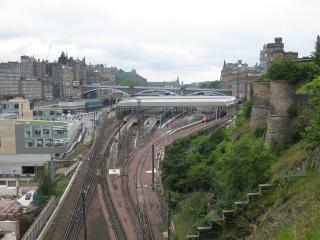 I did visit Edinburgh castle, and it's quite nice; a little like Stirling but larger. 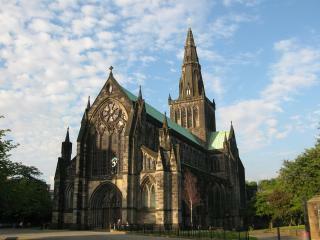 Glasgow was the final destination. We spent most of the day walking about town. The science museum is very far and there are no convenient buses, and children were everywhere. Downtown is very nice, much less gloomy and gray than Edinburgh. It's quite enjoyable to wander the streets. It was overcast at first but then the sun came out. It's very striking that there are almost no outdoor restaurants, plazas with tables and bars, or beer gardens in Glasgow, or in Scotland for that matter. Maybe the weather doesn't allow it. We were abnormally lucky, but the weather in Scotland is better known for extensive rain. The next morning we took the bus to the airport. The departures ares is clearly marked with "oversized baggage", "staff only", and "Gents". The X-ray checkpoint dumps everyone into a large duty-free shop, but finally we found the gate. Two weeks later a burning car filled with gasoline was crashing into the same door that we had been using, presumably a terrorist attack - although if that's true they were going about it rather ineptly. The UK is, after all, a country at war.